Cosmic Star Crystal Awards. 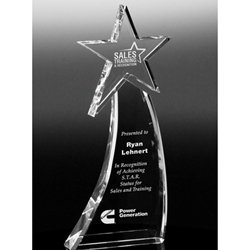 This dazzling award is perfect for a star performer. The Cosmic Star is made of optical crystal and is reminiscent of a shooting star. With ample space for a personalized message, this award is sure to thrill your recipient. 5" wide x 11.5" tall x 1.5" deep, 4.5 lbs.